The referral card will only be accepted from an Andmar Eco-Energy estimator, during the day of the estimate. Only one referral card will be accept per purchaser. The referral program can not be add to any other promotion. There is no limit to the number of friends you can refer to our company. Andmar Eco-Econergy reserves the right to change these terms and conditions at any time without prior notice. Have someone in mind who could use some assistance with heating and cooling? Let us know and make your friends happy. 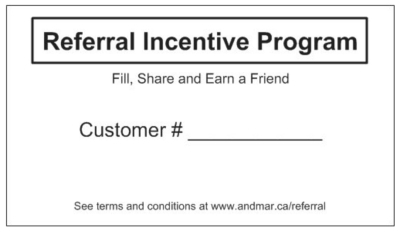 For every referral that results in a purchase of a heat pump from Andmar Eco-Energy, the referrer will get a $50 gift card and the purchaser will get $50 rebate on is first purchase. All referral ​must be refferred via an Andmar Eco-Energy business card. At the back of the business card, the referrer fills his customer number and share to friends.